iF Industrie Forum Design e.V. has given the annual iF Award since 1953. Apart from design, the criteria of the renowned design prize also include degree of innovation, ergonomics, functionality and environmental aspects. More than 5,000 products from 53 countries competed for the iF Award 2015. The variable length washbasins are among the winners of this year's competition. 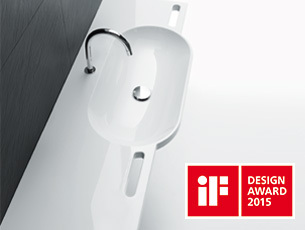 It is already the fifth design award for the variable length washbasins. They have previously received, among other things, the red dot award and the German Design Award. With the award for the variable length washbasins, HEWI has won the iF Award 53 times in total and is therefore one of the most successful companies in the history of the competition.